When I was growing up in a large family, my parents instilled in us certain table etiquette—if not for decorum’s sake, then at least to keep complete anarchy from breaking out while we broke bread. Commandments regarding posture (don’t slouch), arm position (no elbows on the table), and eating style (chew with your mouth closed) were familiar refrains around the supper table. I am thankful to my parents for these lessons, and now I teach my own children in a similar way. 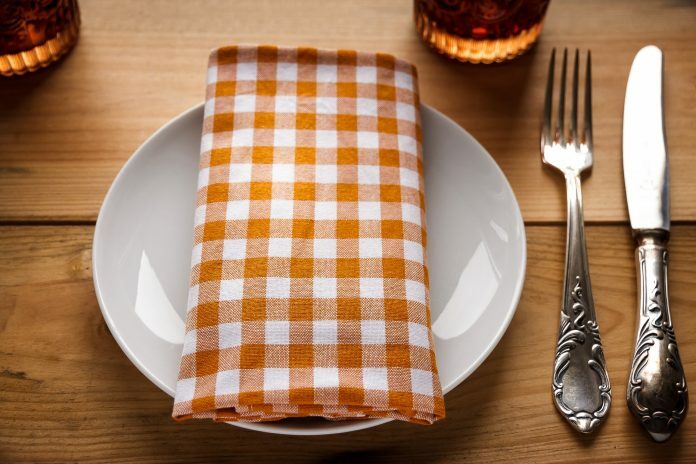 But after I left home, I found myself in certain dining situations where I did not know the rules, mostly because our family meals did not involve multi-course menus, where it was important to tell the oyster fork from the fish fork. (It was enough that we were not flinging forks across the table at each other.) In these situations, I could always tell myself that these were outdated conventions, and indeed these kinds of customs have mainly fallen by the wayside in our current low-tech food culture. But I always felt a lack, and a secret wish that I could conduct myself in the very highest echelons of society without embarrassment or awkwardness. I therefore find it very interesting that Margaret Visser, in her book The Rituals of Dinner, asserts that it is precisely to forestall violence that such rules of etiquette came into being. She argues that “table manners are…a system of taboos designed to ensure that violence remains out of the question,” and that only later did they evolve into the complex, but mostly banal, rituals we know today. One of her primary examples of how the shared table can be a dangerous place, and why table manners are necessary, is the presence of sharp eating utensils at most meals. When everyone at the table is armed with knives, the most common eating implement in the West until recent times, there was always a possibility that mealtime fights would erupt into bloodshed. In fact, a few hundred years ago, it was the custom for each man to bring his own knife to a host’s table—the same knife he used for countless other purposes. It may have been in response to the danger these knives posed that the French king banned pointed knives from the table in 1699, replacing them instead with the rounded knives still in common use. Even with such a precaution, it is now still correct etiquette for knives to be placed on the table with the blade facing the plate, and to be replaced in the same position after the meal. And even those of us who do not have a delicate grasp of the nuances of cutlery placement know that it is bad manners to point a knife at someone else or at oneself while sharing a meal. In contrast to the knife-centered history of the West, chopsticks have been the preferred eating utensils in Japan and China for thousands of years, possibly influenced by the teachings of Confucius, who believed that “The honorable and upright man…allows no knives on his table.” Knives are a symbol of violence or aggression, and therefore were contrary to Confucius’s nonviolent teachings. But even though chopsticks do not have the implied violence of knives, there are still certain taboos about how chopsticks may be used. In Japan there is an aversion to passing food via chopsticks from one person to another while eating together. This action recalls part of the Buddhist funeral ritual, in which family members use chopsticks to pick up bones from the crematory ashes, and pass them from person to person before they are placed in an urn. Also, it is not correct to leave chopsticks sticking upright in a bowl of rice, as this is reminiscent of a tribute to the dead (the deceased’s chopsticks stuck in a bowl of uncooked rice on the family altar). I guess I always knew that more was at steak (sorry!) than politeness during our family dinner hour. We were keeping our violent tendencies at bay by keeping our knives to ourselves and resisting the temptation to leap out of our chairs at each other. We were, in fact, learning how to peacefully co-exist in a stressful situation (worrying about getting our fair share)—and were following the original intent of table etiquette, if not all of its arcane proscriptions. Note: This is an updated version of an article that originally appeared on Interesting Thing of the Day on May 20, 2005.